About the time they arrived in America, John Parmelee Sr. and the 24 other men whose families would later settle at Guilford entered into the Plantation Covenant. John, who would have been about 55 at the time, would have been one of the oldest members of the Rev. Henry Whitfield's expedition. As late as the 1990s--more than three and a half centuries after the covenant was formed--the descendants of John Parmelee Sr. and 14 other signers still reside in the Guilford area. This is a copy of the Massachusetts Historical Society's contemporary copy; the location of the original document is unknown. Contemporary copies, such as this one, are easily identifiable as all the signatures -- except Whitfield's which is below all the rest -- are in the same hand. One theory is that one of Whitfield's relatives made the copies and let him sign the documents himself. "John Parmarly" is at the left of the fourth line of names. Click on the thumbnail of the document to download a full-size copy of the covenant. "We whose names are herein written, intending by God's gracious permission, to plant ourselves in New England, and if it may be in the southerly part, about Quinpisac [Quinnipiac, later named New Haven], we do faithfully promise each for ourselves and families and those that belong to us, that we will, the Lord assisting us, sit down and join ourselves together in one entire plantation and to be helpful to the other in any common work, according to every man's ability and as need shall require, and we promise not to desert or leave each other on the plantation but with the consent of the rest, or the greater part of the company, who have entered into this engagement. "As for our gathering together into a church way and the choice officers and members to be joined together in that way, we do refer ourselves until such time as it shall please God to settle us in our plantation. 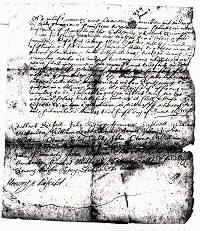 "In witness whereof we subscribe our hands, this first day of June 1639.